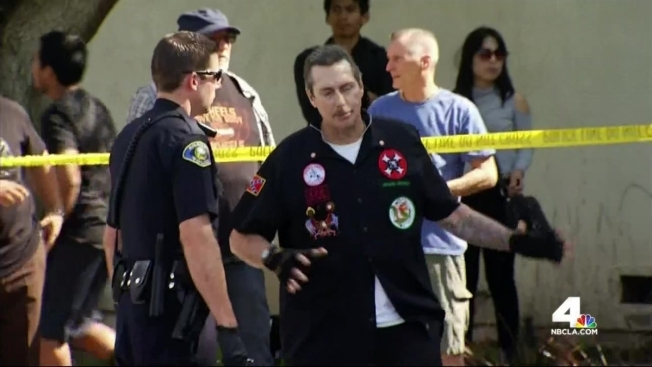 Police said three people were stabbed, and 12 were arrested, in separate incidents at a Ku Klux Klan gathering that turned violent in Anaheim on Saturday. Police were still searching for one man believed to be involved in the melee late Saturday. The stabbings broke out about 11 a.m. near the site of an planned afternoon rally at Pearson Park located in the 400 block of North Harbor Boulevard, according to Sgt. Daron Wyatt with the Anaheim Police Department. Police had said Friday that the department was aware of a KKK "walking protest" planned at the park for 1:30 p.m. Saturday, and that the group had held similar rallies before in Orange County. "APD will be monitoring the situation for any violations of law," the department said on its Facebook page. The attacks began when a group of Klansman pulled up in a vehicle near the corner of Cypress Street and Harbor Boulevard where a group of counter protesters had gathered, Wyatt said. A Klansman stabbed a counter-protester in the chest with an eagle figure at the end of the flag, according to Wyatt. The protester was transported to a local hospital in critical condition. About one block away, another protester was allegedly stabbed by a Klansman, who was later taken into custody. The protester's condition was unknown. Counter-protesters stomped on Klan members, injuring them, Wyatt said. Police said six Klan members and seven counter protesters were arrested following the brawl. Ultimately, seven were booked, four were released and one detained was a juvenile. Firefighters also treated another protester who suffered a minor stab wound. Tyler Matias-Lopez, 16, was in the park with his family watching as the violence ensued. "There was one guy that got kicked in the face. But there was around 10 people that just started hitting the guy," Matias-Lopez said. According to the Anaheim police Facebook post, the KKK rallies typicaly involve literature being passed out – a process that is protected under the First Amendment. "It is not uncommon for these groups to place their literature in yards and driveways in the surrounding area prior to or immediately following their gathering. This dissemination of literature is not illegal," the post says. Editor's Note: Police initially told NBC4 that a KKK member was stabbed, but later said a counter-protester was the stabbing victim. This story has been updated.